This really could be the only dirt pedal you'll need. Huge range of dirt sounds; top-notch build quality. The design of the Calibre knob means it makes noise as you turn it. Adrian Thorpe only launched his first pedal in 2015, but ThorpyFX is going from strength to strength. This brand now has four pedals in its roster and scooped the winning drive pedal award in our Gear Of The Year Awards with the Fallout Cloud. The Warthog is an overdrive/distortion pedal named after the US Air Force's robust A-10 combat air support aircraft. It was officially known as the Thunderbolt II, but was given the 'warthog' monicker because it was seen to be ugly - not a description that can be applied to this pedal with its pastel and chrome chassis combined with red chickenhead knobs. 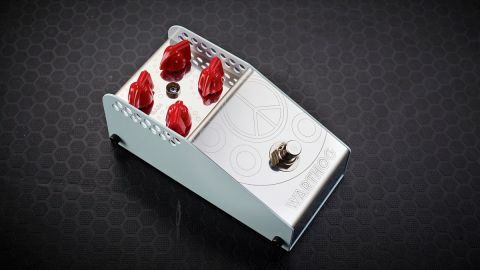 It is, however, as robustly stage-proof as you're likely to get in any pedal, with its four knobs recessed below the level of the footswitch where they can't be accidentally adjusted, and its connections tucked away at the front. The workmanship follows high standards, utilising the best components, and while the shape of the pedals suggests they're large-ish, they're only marginally wider than a Boss compact and about 20 per cent bigger from back to front, so no headache for pedalboards. In fact, they'll fit across two spars of Pedaltrain 'boards. Where other distortion pedals give you just gain, volume and tone knobs, the Warthog adds a Calibre knob. Previously seen in the Gunshot overdrive pedal, it controls a second gain stage - a preamp at the start of the circuit. Using it in conjunction with the main Gain knob, and tempered with the Tone control that places top-end in context, endows the Warthog with a range of dirt sounds that also allows it to work hand-in-glove with a disparate range of amps. From boost through overdrive to all-out saturated distortion, there's fantastic flexibility here. At minimal gain settings and with the Volume knob on full, you can get a clean boost, but bringing in gain yields a gritty overdrive with the flavour of a cranked tweed amp. That American vibe continues as you bring in the Gain, until you get into the territory where an amp's valves are sizzling; the Calibre knob piles on the saturation and harmonic richness, while increasing treble and bass content, emphasising the impression of a lean midrange and maintaining note clarity. Full on, there's a hint of fuzz to the thick distortion, all responsive under your fingertips and cleaning up beautifully with your volume knob.